Comments: When Anakin Skywalker falls to the dark side and becomes Darth Vader, he casts off his entire past. To further embrace this change, he paints his starfighter black and chooses a black astromech droid to replace his former droid companion R2-D2. The outer darkness of his fighter and droid mirrors the inner darkness of the new Sith Lord. 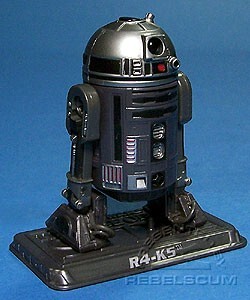 R4-K5 is a repaint of 2005's ROTS R4-G9. The display stand has the wrong logo. It should be the generic Star Wars logo that has been used for Expanded Universe characters. Several typos have been found on the cardback: The words "Dark Vader" and "new the Sith Lord" have been found. On this particular card, "Darth Vader" has been fixed. Also included with this figure is a folding pamphlet that shows other toys in The Saga Collection.